Once upon a time, a thousand years ago in a church which was probably several hundred times larger than S Thomas's, the great basilica of Blachernae in Constantinople, high up on the ceiling near the Altar, was an enormous picture of a Palestinian teenager, that selfsame Girl who is such a lead-player in the Christmass celebrations. There she stood orans, her hands raised in prayer, and in front of her womb, in a round circle, a painting of her Divine Son - his hand lifted in blessing. That image of Mary was called Platytera tou kosmou, the Woman Wider than the Universe. 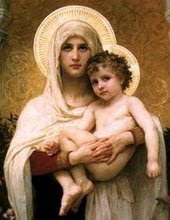 Mary was Great with Child; her Child was Almighty God. She contained the One whom the heaven of heavens is too narrow to hold. Can a foot be larger than the boot or an oyster greater than the shell? For Christians, apparently, Yes. Mary's slender womb enthroned within it the Maker of the Universe, the God who is greater than all the galaxies that stream across the firmament. The tummy of a Girl was wider than creation. Then on the crisp night air came the squeal of the newly born baby. It came from the cave that was both a stable and a birth-place. That stable in Bethlehem, as C S Lewis memorably explains in The Last Battle, 'had something in it that was bigger than our entire world'. The stable, like Mary, was great with child; very great, for that Child is God. And what is true of the womb of the Mother of God, and what is true of that stable at Bethlehem, is true also of what we are about here this Christmass. Bread becomes God Almighty; little round disks of unleavened bread are recreated by the Maker of the World to be Himself. As Mary's Baby was bigger than all creation, than all the stars and clouds and mass of it, so the Blessed Sacrament of the Altar is bigger than the Kosmos. As you make your Christmass communion, glorious and loving Infinity comes to make His dwelling in your poor body; so that, as you walk or drive home for the rest of Christmass, you are platyteroi tou Kosmou: broader than the Universe. A new phenomenon in religion is becoming more prominent as each year passes. It is a syncretist movement aiming at the union of all those who believe in God. This phenomenon goes far beyond the so-called ecumenical movement, which strives to unify all those who call themselves Christian. Before the Roman church took the ecumenical movement seriously, she generally alluded to it disparagingly as pan-Protestantism. The new movement is blessed by some of the hierarchs of the Roman church as the pro Deo (for God) movement. It is interesting to note in this connection the changing vocabulary of the Vatican. Some recent popes have made much use of the terms Il Padre Commune ("The Common Father") and La Casa del Padre Commune ("The Father's House"-- the Vatican) in their appeals to bring Christians back home. In establishing this new activity, the Pope now describes Rome as the Patria Commune, the "Common Fatherland" for all believers. However difficult it may be for Muslims, Buddhists, and Jews to regard Rome as their "common fatherland," the idea is that a new secretariat will make them feel that they now "belong." The activities of the pro Deo group, which no doubt pave the way for a new secretariat, seem to have been chiefly confined to organising international banquets, called agapes or love-feasts, thereby changing the character of the meetings of the early Christians, which were certainly closed to non-Christians. To those familiar with the history of the Roman Catholic missions in recent centuries, the idea of fraternising with oriental religions is not completely new. Throughout the seventeenth century and well into the eighteenth a bitter controversy raged between certain Jesuit missionaries and their opponents about what is sometimes called "Chinese rites." In fact, the desire to transform Catholicism into an oriental cult, though within certain limits, began with the Jesuit missionary De Nobili (1577–1656) early in the seventeenth century. He assumed the saffron robe of the monk, observed Brahmanic rites and fasts, and tried to be as much like a Brahman as possible. In China the Jesuit missionaries later attempted to use similar methods in order to make themselves as completely oriental as possible. Despite fierce opposition, the methods of De Nobili were approved for a time. But all these attempts to "naturalise" Roman missions in the East were finally suppressed by the bull of Pope Benedict XIV (1675-1758), Omium Sollicitudinem, in 1744. After this decree, the Roman missions in the East were destined to become like so many Latin colonies planted on foreign soil. This has often been deplored in modern times, and no doubt the recent Vatican approach may be seen as a return to the "assimilation" attempts of previous centuries. Evangelicals do not always realise how spiritually satisfying to some Roman Catholic intellectuals is the idea of assimilating and adapting all human cultures--and to some extent all religions--inside one vast theocratic Roman Catholic Church. Karl Adam (1876–1966) in his Spirit of Catholicism (1954) has tried to show how much this is a part of the modern Roman Weltanshauung. An increased impetus in this direction comes from a growing consciousness that the Catholic-Protestant divisions seem to be lessening and that many world cultures are still outside the range of Catholicism, especially of a Catholicism identified with Western culture. Some have begun to ask if African and Asiatic cultures might have something in their philosophy, theology, and mysticism, as well as in the less difficult fields of music and art, that might be included under the name "Catholic." Certain Roman apologists might boldly assert that these cultures "belong" to the Catholic idea. Teilhard de Chardin (1881-1955), chiefly through his posthumous book, The Phenomenon of Man (1955), has become the prophet of a new evolutionary outlook, centering the climax of world development in the formation of a new creation in Christ. This would imply for some-- among them, no doubt, Arnold Toynbee (1889–1975) with his synthesis of world history-- the idea of a convergence of religions, however repellent this might seem to many. I first came upon this extension of ecumenism into pan-deism among some Roman Catholic scholars interested primarily in the "reunion of the churches," Roman, Orthodox, Anglican. This was just before Pope Pius XI (1857-1939) brought out his encyclical, Mortalium Animos (1928) which was seemingly directed against the World Council of Churches and the ecumenical movement generally. These were condemned as "pan-Protestantism." Yet even then a number of Roman scholares had already made public the idea that the Church Catholic is "Jewish, is Moslem, is Buddhist, is Taoist." The idea behind this was the concept of a true catholic or universal order of religion that must be able to include the highest aspirations and achievements of all religions and cultures. It was felt that the same ecumenical spirit that sought to bring together the historically separated Christian churches should be able to reach out the religions of Asia, of Africa through Islam, and to the Jewish diaspora. An obvious bond with Jews and Muslims through the Old Testament was recognised. The "Our Father" of the Christian was also the God of the Jews and the Allah of the Muslims. It was explained that to unite with Hindus and Buddhists, Christians should explore the hidden reality-- the "ultimate reality," the infinite, the absolute, the everlasting, the all-pervading spirit that marks the religious experience of the Orient. Many felt that Western culture has lost the sense of a living and inspiring presence in intimate religious experience and "knowing," because this is not regarded as something for the ordinary believer but is rather the privilege of an esoteric few, called "mystics." Some religious observers in the Roman church have believed that just as contact with non-Roman churches might have a salutary and broadening influence on many Roman Catholics, so also for people of Western culture, contact with the religious experience of the East might lead to the vitalising effects of the "inner light" and the "inner presence," which seem so essential a part of the oriental religious outlook. Surprisingly, some have seriously declared that this universal outreach should include even atheists, on the plea that many so-called atheists are in reality seekers after God in their own perverse way. We may perhaps ask what is the ultimate aim of the Curia in promoting the pan-deist movement. Undoubtedly, certain Roman Catholic thinkers have a sincere desire to promote greater unity and peace in the world. Such thinkers envisage ecumenism as a fulfillment of Christ's prayer, "That they all may be one." Their beliefs and education convince them that unity implies submission to one authority, and this submission is taken to be a divine mandate to include everybody in the one sheepfold of the pope. The same thinkers accept as a natural prerogative Rome's promotion of world unity by any religious means whatever. Thus they do not necessarily discern in Rome's ecumenism and pan-deism a project for world dominion. Yet this danger certainly exists. Evangelicals should remember that the bull of Pope Boniface VIII, Unam Sanctam (1302), still exists and is generally taught as an infallible utterance in Roman seminaries. In this bull the pope proclaimed that to attain salvation every soul must be subject to the Roman pontiff. He also promulgated the doctrine of the "two swords"-- the spiritual and temporal-- by which he affirmed the the pope as vicar of Christ had supreme power not only in religion but in all things temporal.